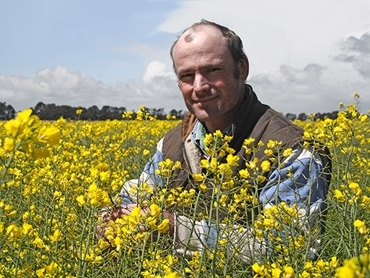 A Lake Bolac farmer has implemented an Integrated Weed Management (IWM) program at his property to tackle increasing herbicide resistance on canola paddocks in the area. Rob Coutts implemented the weed strategy at his family cropping and sheep enterprise this winter. Populations of ryegrass and wild radish in particular have become a concern at the grower’s property Iona, which he farms with his father Lee and brother John; to manage the problem, he will rotate all herbicide technologies at his disposal, including Triazine Tolerant, Clearfield and Roundup Ready from Pacific Seeds . The biggest risks in the area at the moment are ryegrass and wild radish, so this winter the farmer will be growing TT for the grass control, CL for the control of wild radish and RR for enhanced yields and knockdown control of in-crop weeds. Mr Coutts explained that they plan to use all of these varieties as part of a rotation for better weed management and to reduce risk. Mr Coutts grows a range of crops at Iona, including wheat, barley, lupins, oats, beans, pastures and legumes, summer fodder and lucerne. While he has previously grown a combination of hybrid canola and open pollinated canola, he will now focus his efforts solely on hybrids. One hybrid he was particularly impressed with last season and will be growing again this season is Hyola 575CL, which was planted on 60 hectares next to two OPs and it had good yields, very good oils, was tremendously tall and had good blackleg results. At harvest in late December, the 575CL yielded 2.9t/ha with 44 percent oil. Despite last season’s weather not being in the grower’s favour with a dry start and below average rainfall, the canola pulled through thanks to a damp finish. They sowed in early May on 10-inch row spacing, direct drilling the seed with narrow points into barley stubble at a rate of 2.5kg/ha. Fertiliser consisted of 80kg of MAP and 50kg of urea at sowing, followed by another 100kg urea pre-flowering. The chemical plan was made up of Roundup, Edge, Hammer and Intervix as per the label. Mr Coutts will follow a similar approach this season, saying an IWM strategy along with his extensive herd of Merinos will put the farm in good stead for the future.